The Dermatology Department of The State University of New York Health Science Center at Brooklyn (SUNY Downstate Medical Center) featured Carlos K. Wesley, M.D. as he delivered their Grand Rounds lecture recently. 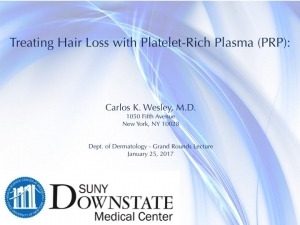 Dr. Wesley discussed the merits of platelet rich plasma (PRP) as a treatment for hair loss. In addition to providing a general overview of the mechanism of the PRP treatments and how they stimulate hair growth, Dr. Wesley lectured to dermatology residents and seasoned attending physicians about the technical variables of the treatment itself that can optimize the benefit to patients. 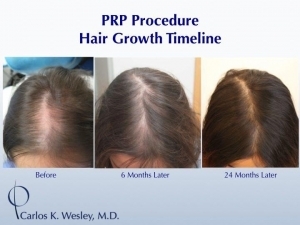 Dr. Wesley, who has been performing PRP procedures to treat hair loss for nearly a decade, had been featured in The New York Times. Based on his empirical findings and his remarkable success with patient outcomes using this therapy, he has been invited to deliver lectures on this topic to physicians nationwide.